Since there's no moratorium on wishing a "happy New Year," we at Words Take Flight Books are wishing you and yours the same as we get a belated beginning to 2017 – but "better late than never" has never sounded so good. 2016 is in the books (thankfully) and we can all agree that it's more than likely not going to be one any of us will be picking up again and saying, "Huh. Boy, I really enjoyed that one the first time – maybe I'll give it a re-read!" With that being said, you obviously will be needing some new reading material in 2017 – and Words Take Flight Books is looking forward to enabling your "need for read." Kevin Ranson's The Matriarch Saga will draw to a close this year – if you haven't read the first three critically acclaimed books, it's high time you got started. If one author (who shall remain nameless – consider this your noodge) completes his anthology, you'll be in for a treat of short stories with an edge that will leave you with papercuts that will keep you up at night. We also have another new writer joining us, who will be haunting you with his photographic and literary love of the supernatural. And for the parents and teachers in the audience, our first children's book, There's a Monster at Mr. Baxter's, will get its long-anticipated debut. You want more? Good things come to those who wait – check back often and follow us on Facebook! And WE want more! Writers? Did you make that New Year's resolution to finally get published? We're waiting to hear from you! Click over to "Join" and get started today! Words Take Flight Books was not planning to publish this book for another month – a book of disturbing fiction that is all the more troubling because it is based on facts and reality. Facts and reality about our nation's obsession with and refusal to regulate guns. Facts and reality driven home by another massacre of innocents that could have been prevented by sensible gun laws. But we and Brent Monahan agreed that we could no longer wait to add our voices to the outcry – read FROM THE EDITOR'S DESK for more. 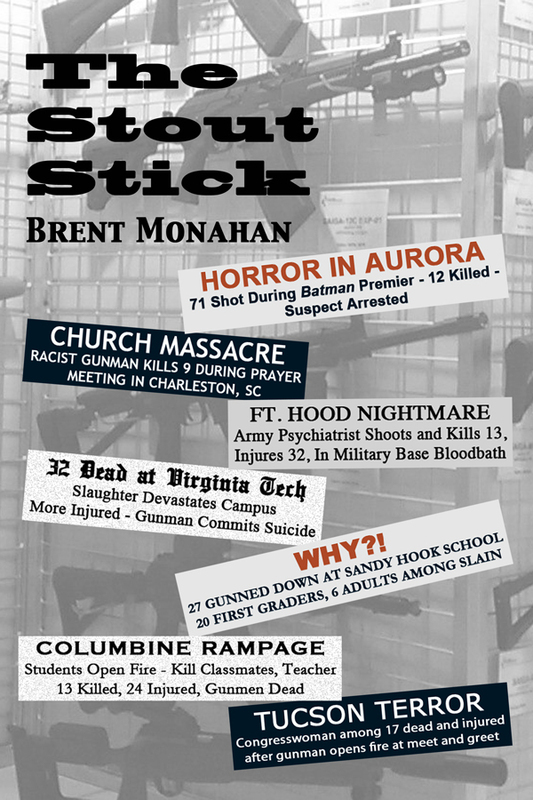 THE STOUT STICK is, again, a work of fiction. However, its central argument we see as no less outrageous than those being presented by the gun manufacturers and their lobbies, or the so-called "public servants" who pander to those manufacturers and lobbies for campaign contributions. No less outrageous, either, than the attitudes of that small, but vocal, portion of the electorate that sees even reasonable limitations to gun ownership as assaults on the Constitution and their perceived "God-given rights." Words Take Flight Books presents all of the hitman horror and dark humor you'll find anywhere in a book cover. For the first time, you can read Mitch Hyman's "Hitmen Supreme" novella and novel together – and with only a brief intermission (if you can put it down that long). Hook, Line & Sinker: Wherein two hitmen turn a "friendly" fishing match into a deadly fight for gangland supremacy under the watchful eye of a powerful spirit – and her cookies. 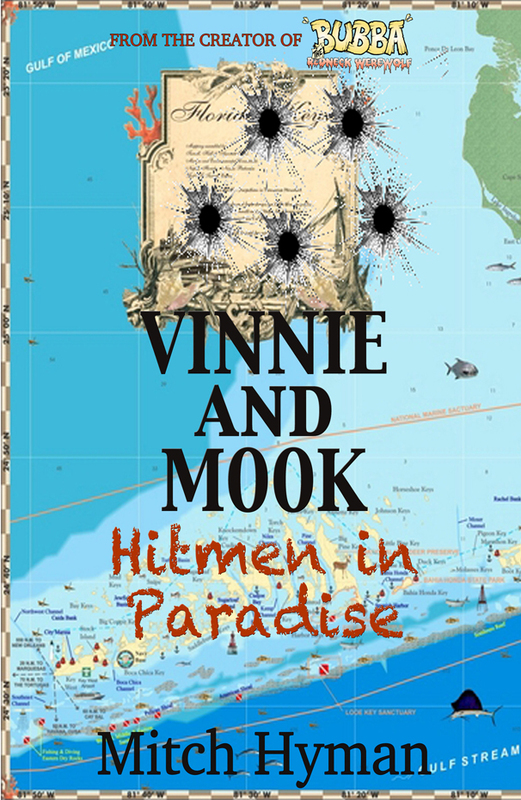 Hitmen in Paradise: Beneath the blazing Caribbean sky lurks an ancient, undying evil – and Vinnie and Mook unwittingly find themselves in a battle not just for their own lives, but for all of mankind. Click here to keep a vampire down a pint and save a life - buy a book (or five) and support the 2nd Annual Vampire Books for Blood fundraiser! Words Take Flight Books is proud to partner with Vampire Books for Blood to raise money for much-needed support of the American Red Cross's blood donation program. For the entire month of October, we'll be donating 10% of all sales of our acclaimed vampire books by Brent Monahan (The Book of Common Dread and The Blood of the Covenant) and Kevin Ranson (The Matriarch, The Matriarch: Guardians and The Matriarch: Changeling) to this worthy cause. THE END IS NEAR! Read the penultimate chapter in THE MATRIARCH saga - but only if you've finished the first two! With only one book left in The Matriarch saga, time is growing short to seek refuge at Cedarcrest Sanctum - and it's running out for the staff and residents, too. 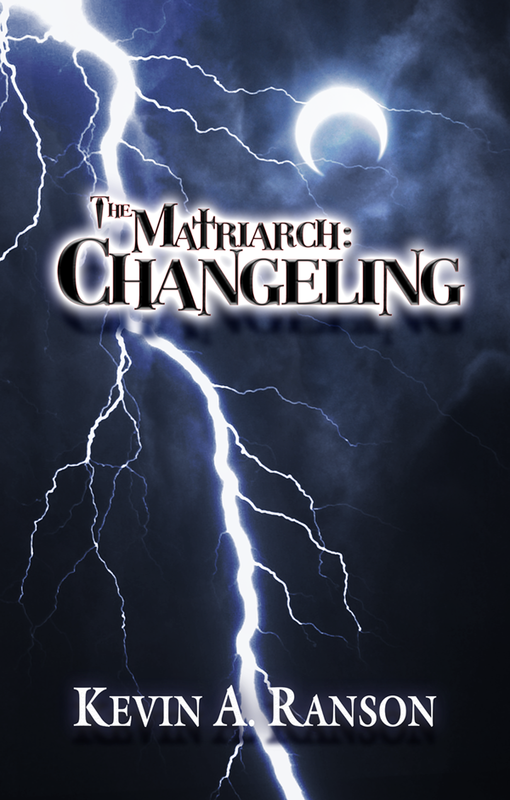 The Matriarch: Changeling changes the rules on good and evil in the world of Janiss Connelly, administrator of Cedarcrest. To rescue her friends and the people she has sworn to protect, she must evolve and become something stronger...and potentially more horrifying. But reality isn't what it seems and her greatest enemy - and danger - isn't on the outside, but on the inside. Will she learn the truth before she loses not just Cedarcrest - but her soul? The Matriarch saga is smart, terrifying vampire reading. With each book, Kevin Ranson expands and deepens the world of Cedarcrest Sanctum and the forces that hold it together from within - and those that are trying to tear it apart from without. Read The Matriarch: Changeling today - but first read the novels that started it all. In our ongoing mission to give a voice to new authors, Words Take Flight Books is proud to introduce you to your next household name in mystery - Thomas Reeder. Once you read Poetic Justice, you will understand our enthusiasm. Set in the Jersey Shore town of Beach Haven in the 1930s, this noir novel harkens back to the glory days of hard-boiled detective stories. 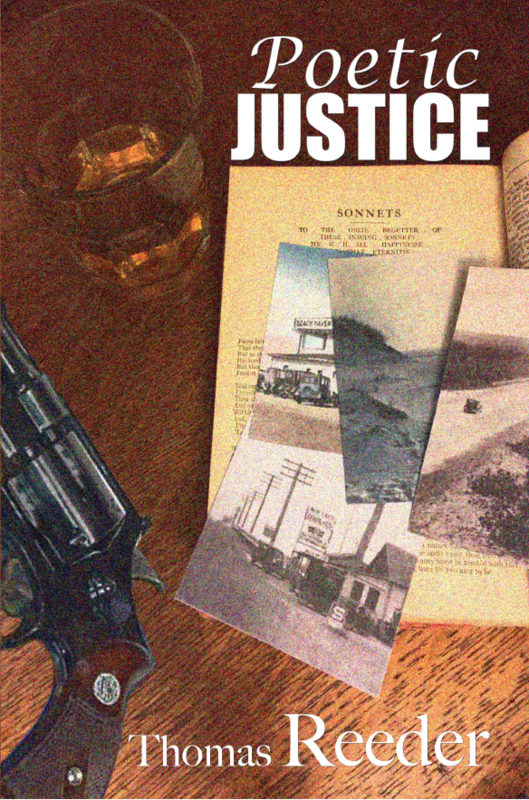 Some-time bar owner and one-time... specialist...Lewis Porter is pulled out of his self-imposed retirement by two seemingly open-and-shut cases: a murder and a disappearance. But as the victims and questions mount, and Porter digs deeper for the truth, he learns that sleepy Beach Haven harbors very dark secrets - and darker sins and sinners. And the latter will stop at nothing to let sleeping towns lie - even if it means justice isn't served. Over Porter's dead body - and that's just what it might take. What would you trade for a once-in-a-lifetime chance for success? Frank Spiegel and his traveling magic troupe put their lives and friendships on the line to answer that question in Illusions. You will learn that magic does exist - and that its power comes with a price. The ultimate price. Click here to learn more and buy Illusions - make it your first New Year's reading resolution! 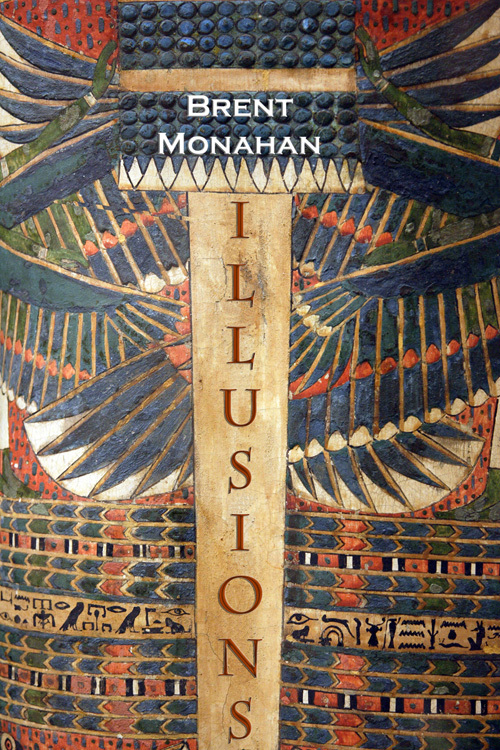 Illusions is Brent Monahan's foray into the world of professional magicians, where the line between illusion and reality is forever blurred. But not for Frank Spiegel, "Master of Illusion." To him, there is no magic - no real magic. That is, not until he and his troupe uncover a sarcophagus reputed to have tremendous magical power. Trading their "most prized illusion," they gain possession of the artifact that could change their lives - only to learn that it could mean their lives. In Illusions, the most powerful deception is the one we commit on ourselves when we think we have nothing to lose. The wait is over! From Ashes is available now. Once again, JD Phillips delves into the darkness to tell the story of a young man's struggle to escape his tormented past only to face it again in his present. The question is, will he survive to see his future? Click here to find out. 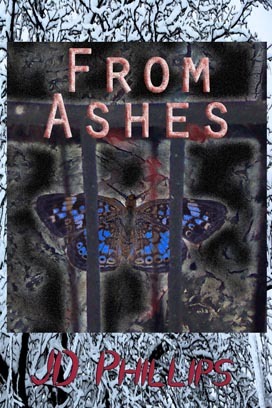 From Ashes is JD Phillips' latest journey into the dark places of the mind into which only the bravest writers - and readers - dare venture. Today, Kell is a common street hustler trying to make a buck and satisfy his pimp's demands - but more was expected of him...when he was the "Little Phoenix." The young boy - the only survivor of a deranged kidnapper, child molester and murderer. Now, Kell finds himself reliving his childhood nightmare at the hands of two mysterious kidnappers bent on breaking him before killing him. Will he die before he breaks - before he learns the truth about his torturers, about his past and, most importantly, about himself? The only way to know is to journey with Kell - and JD Phillips - into the darkness. From Ashes - this November from Words Take Flight Books. Click the image to read more. New York had seen its share of hatred of and violence against homosexuals; but the brutality of the 1990 slaying of Jimmy Zappalorti, a gay Staten Island man, was such that it could not simply be just another statistic on a chart. Heinous in the extreme, it sparked protests that ultimately led to New York passing its first hate crimes bill in 2000. Stained Glass Windows: The life and death of Jimmy Zappalorti tells that story - Jimmy's story: his youth, his coming out while in the Navy and the subsequent attack that forever changed him, his life upon returning to Staten Island and his untimely death at the hands of two men who hated him for only one reason: he was gay. It is the story of a devastated family that channeled its pain into seeking change - to ensure that there was justice for Jimmy and for the entire LGBT community. CLICK HERE to learn more and to purchase Stained Glass Windows. This past June marked the 45th anniversary of The Stonewall Uprising that signaled the beginning of the gay rights movement. In 2014, the struggle for LGBT rights and equality continues in the face of ignorance, prejudice and, sadly, violence. January 2015 will mark the 15th anniversary of another “sea-change” moment in the fight for LGBT equality – one equally stained with tears and blood. 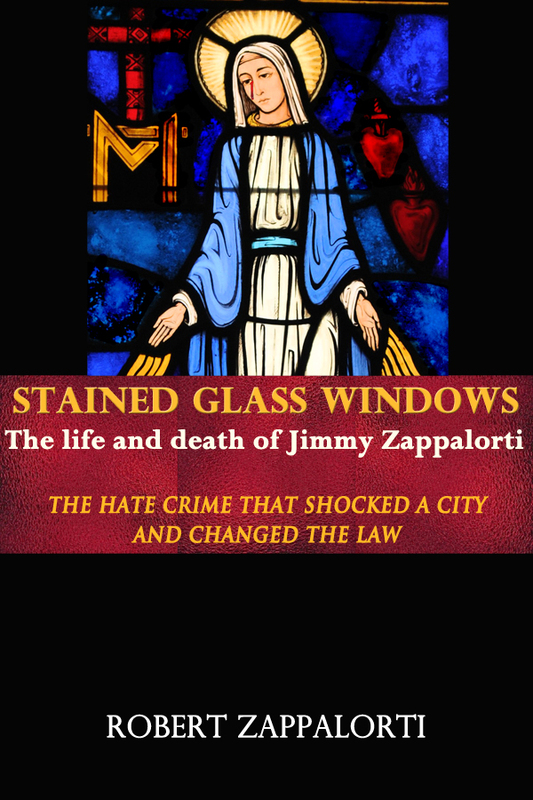 It is in this very significant year that Words Take Flight Books has the privilege of releasing Stained Glass Windows: The life and death of Jimmy Zappalorti. Brutally murdered because of his sexual orientation, Jimmy Zappalorti's death sparked a public outrage that led to the passage of New York's first hate crime bill. This is a must-read book about a crime that shocked a city and state to take action against prejudice. Kevin Ranson will be representing the staff of Cedarcrest Sanctum from July 18-20 at Ancient City Con in Jacksonville, Florida. This is your chance to meet the author and pick up your autographed copy of the latest book in The Matriarch series, The Matriarch: Guardians. Wait - you haven't read the first novel,The Matriarch, yet? Well, from July 15-17, you can download it free at Amazon for your Kindle or Kindle-ready device. Click here to stake your claim today - and stop by to meet Kevin Ranson at Ancient City Con! Readers demanded it - and Kevin Ranson knows how to deliver. 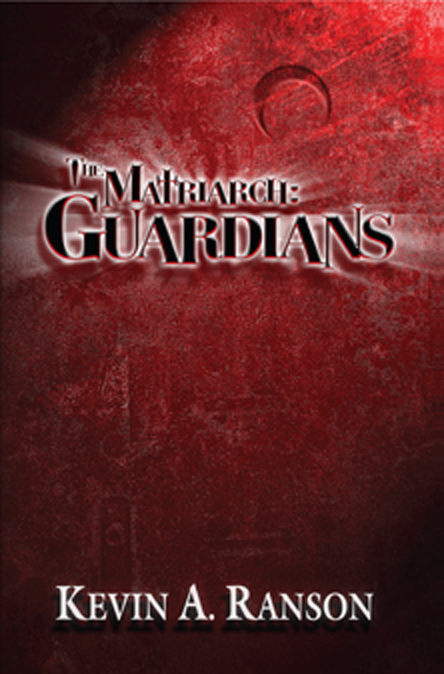 The Matriarch: Guardians picks up where the first book ended - and it takes off from there, not stopping until the last page. Janiss Connelly is at a crossroads between her old and new "lives" - but what was in her past is destined to be a part of her future. A potentially deadly part. Everyone is seeking answers: Janiss needs to find who is creating and killing new vampires. Daniel's brother wants to find the truth about his sibling's death. And readers want to know if a new foe is really a new ally - and what's next for Janiss and the Cedarcest Sanctum staff. "Vampire lovers have found their next favorite vamp series!" 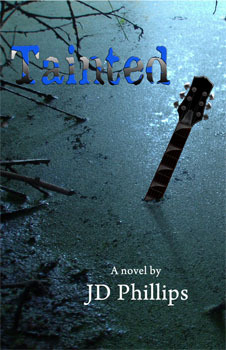 First published in 2006, JD Phillips' Tainted is now yours in this new Words Take Flight Books re-release. Follow the rise and fall of the rock band Nefarious, from the heights of success to the depths of the dark, dead pool from which all things spring...and to which they must return. Drink your hot chocolate, tea or coffee while reading it - but nothing will warm this dark, intricately woven story that treads the line between the psychological and supernatural, between the evil that is in our minds and in the place we all fear to go. Or are they the same? Winner of the first runner up in the 2007 Best Book of Indiana awards, Tainted is now yours. Welcome to 2014 - we hope that the year to come brings you, your families and friends equally heaping measures of health and happiness. And welcome to a new us - not really...it's who we always were, just not how you always knew us. Confused? Concerned? No need to be. Just read the latest installment of From the Editor's Desk to learn more. What do we have up our sleeves for 2014? Well, quite a lot - in fact, our tailor is on a six-month sabbatical after what we put him through in preparation for the New Year. It's time to let the words take flight - hang on and enjoy the ride! We are very pleased to bring you a special book - with an equally special purpose: to fight hunger (see below). Love, My Neighbor, the newest work by Brent Monahan, continues our mission to help you change your perception of yourself as a reader - by asking you to look at certain perceptions of yourself. Looking at the cover image, you are thinking that this is going to be a heavy-handed lesson in religion. But look at the subtitle: "A novel of faith." 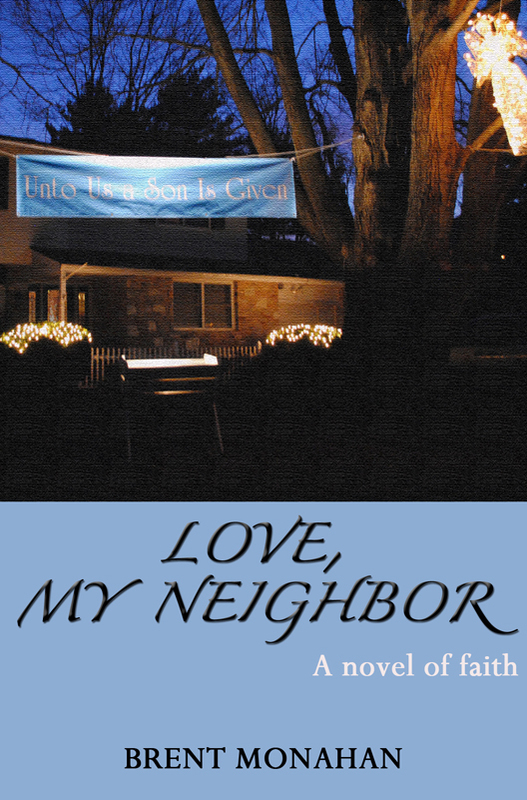 Love, My Neighbor is for any person who has ever lost their faith in anything or anyone - especially in themselves. For a better understanding of the book and why we are publishing it, please read the latest installment of From the Editor's Desk. Purchasing Love, My Neighbor is also your opportunity to provide a person in need with food and companionship - the very essence of being a good neighbor. Through our LOVE MY NEIGHBOR FIGHT HUNGER CHALLENGE, we are partnering with Aid For Friends (AFF) a not-for-profit organization providing home-cooked meals and companionship to homebound individuals in the five-county Philadelphia region. Click here to learn more. WTF Books author Kevin Ranson will be attending a special book signing of The Matriarch at the place where it all began: Glenville State College in Glenville, West Virginia. On December 2, from 9:00 a.m to 1:00 p.m., Mr. Ranson will be "holding down the store" signing books and answering questions about his critic-applauded book on the campus that sparked his imagination. You can visit the special signing event Facebook page here. Perhaps Sis Linn herself will make an approving appearance. Who is Sis Linn, you ask? Click here to learn more. And did you know that it's never too early to start planning for retirement? Click here to learn about a very special place that will bring new life to your "re"-tired blood. We at WTF Books ask of ourselves exactly what we ask of you: to go beyond boundaries. 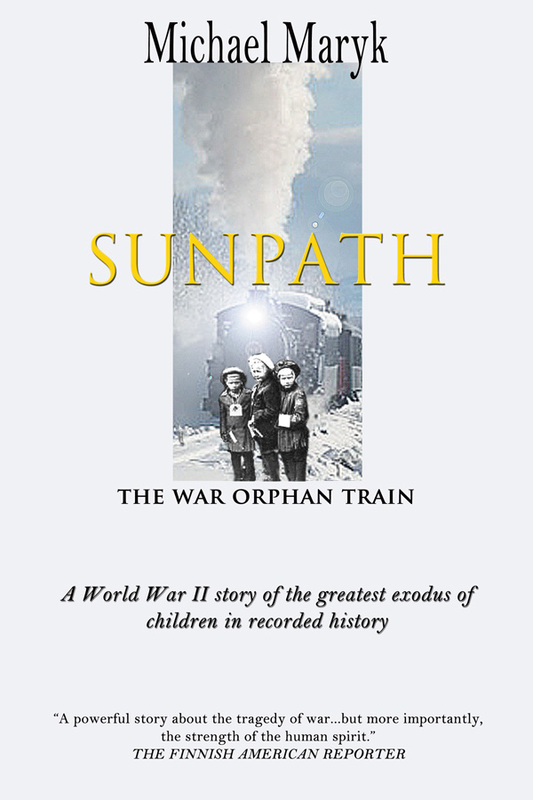 That is why we are proud to announce our latest book, SUNPATH: The War Orphan Train. This is no tale of bogeymen from myth or folklore - there are no heroes with magical powers. No. Our past and present prove that humans are perfectly capable of greater evil and brutality - and good and courage - than can be found in any nightmare or work of fiction. Michael Maryk relied on research and first-hand interviews to create a story of the Finska Krigsbarn - the Finnish War Children. From 1939-1944, parents in Finland sent their children away to other Scandinavian countries to protect them from the ravages of war. Many were taken in by loving families - others were not so lucky. SUNPATH tells the story of the fortunate and unfortunate children. It tells the story of the adults who opened their hearts and homes - and those who offered nothing but misery to war's smallest and most vulnerable victims. Most of all, as we read and watch today's news, it reminds us that we still have much to learn from history. 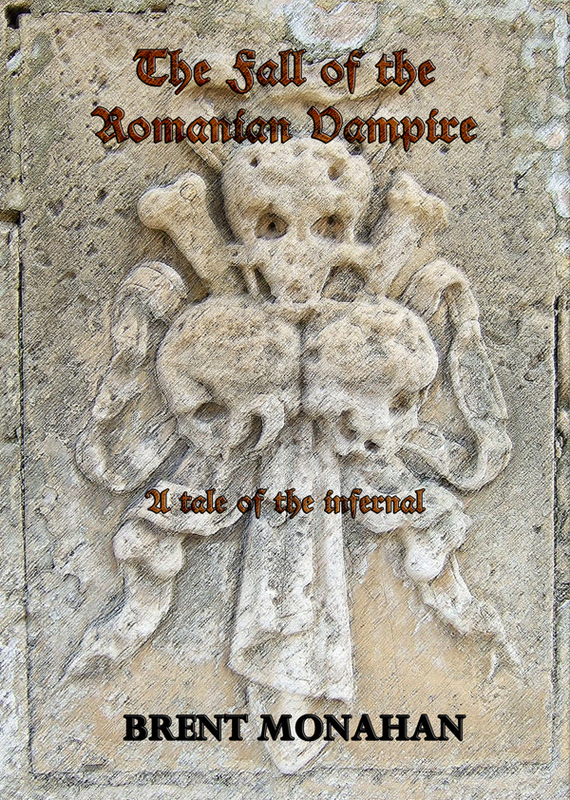 The "Free Fall Weekend": Celebrate the season with a FREE download of The Book of Common Dread AND the long-awaited epilogue to the Vampire Infernal series - The Fall of the Romanian Vampire. A WTF BOOKS EXCLUSIVE! To celebrate the first weekend of fall, WTF Books is giving you some free "Autumn Leaves": for the first time anywhere, you can download here the long-awaited and oft-requested epilogue to Brent Monahan's Vampire Infernal series, The Fall of the Romanian Vampire. But wait - why would you read the conclusion before you read the beginning? To start you on your way, WTF Books is pleased to give you the "Free Fall Weekend": purchase the first book in the series,The Book of Common Dread, for FREE! From now until Sunday you can go to Amazon and download the book that the Indianapolis Star called, "Easily the best addition to the vampire genre since Anne Rice's Interview With the Vampire." Despite reader requests followingThe Blood of the Covenant, Mr. Monahan felt that he had said all that was needed to be said at the book's conclusion. "I wanted to give the reader the chance to 'figure it out' - to use what I put in the books to draw their own conclusions about what might come after," he said. Readers have been waiting for nearly 15 years, but you can't keep a good man - or author or vampire - down. So pick up The Book of Common Dread today, FREE, before you treat yourself to the final, bloody chapter, The Fall of the Romanian Vampire. By all measures, yesterday's re-launch of our website and start of our WRITE THAT FAMOUS BOOK Contest were equal successes. Thank you to everyone who liked us on Facebook and shared both stories with your fellow readers and writers - but one day does not a post make (or something to that effect - I believe I read it somewhere). Keep sharing the message and spreading the word: We want everyone to know what WTF Books is up to and our goal of getting the best writers - and writing - into the hands and minds of readers. Well, only figuratively speaking in terms of the writers - otherwise, things could get messy. Past visitors to (and readers of) WTF Books may notice a few changes to our website - and for you new visitors...welcome! What hasn't changed is what has and continues to drive us: our mission to open up new avenues for readers and writers. Our new look - and new features - will give you a clear view of the road ahead, while keeping an eye on what's approaching in the rear- and side-view mirrors. Remember: objects ARE closer than they appear. For instance, "From the Editor's Desk" will offer you our editor's thoughts and free associations on everything from writing (grammar, style, etc.) and publishing, to literary influences and influencers. From time to time, we will have "guest editors" and interviews filling out the space - so check back in often and follow us on Facebook and Twitter for updates. "Things to Come" is your place to find updates on books in the pipeline - you will also find tidbits on the creative process, letting you "peer behind the curtain." As with "From the Editor's Desk," keep an eye on that space as it will always be a "road under construction." 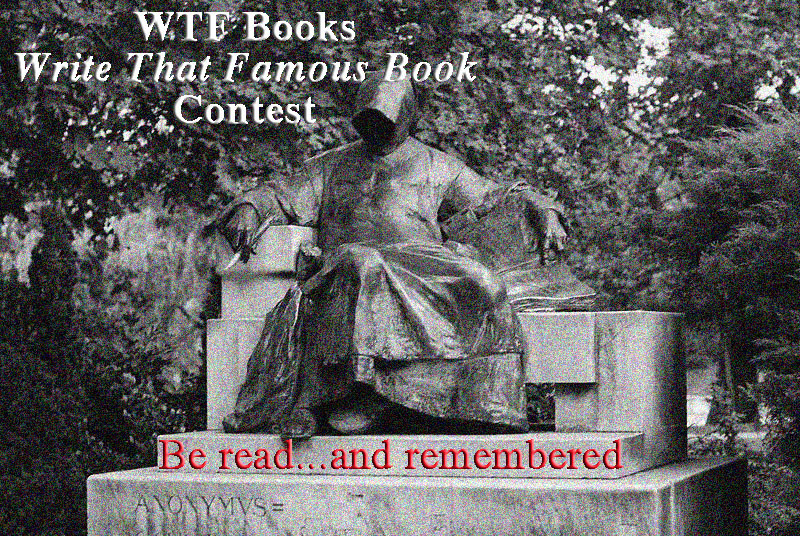 Come with us as WTF Books takes off to explore our new chapter!